Is the Success of You on Netflix a Turning Point in the Inevitable End of Cable Television? Leave a Comment on Is the Success of You on Netflix a Turning Point in the Inevitable End of Cable Television? Imagine you work at Lifetime, home of the infamous all-men-are-evil original movies 11 months out of the year until the entire network turns into a non-stop barrage of Hallmark-esque Christmas movies. Netflix is already coming for you with its own Christmas movies. So what? Movies are so two decades ago. TV is where it’s at, and you haven’t had a real crossover TV series hit since UnReal, which sadly seemed to go off the rails after its first season. It’s high time that changed. So, you partner with the hottest TV producer in the business, Greg Berlanti, who presumably had his need for sleep surgically removed considering (hat tip to Angel) he has over 10 different shows on the air or on streaming. He’s got a new show in development because when doesn’t he have something in development, amiright? 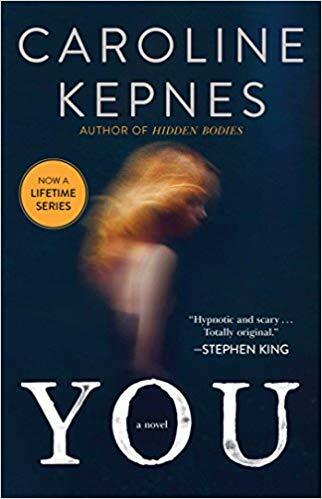 This particular project is based on Caroline Kepnes’ book You: A Novel, whose cover comes with attention-grabbing pull quotes from Stephen King (“Hypnotic and scary…never read anything quite like it”) and Lena Dunham (“My most favorite thriller”). The plot: A meet-cute between a nebbish bookstore manager and aspiring writer/grad student quickly turns meet-gross when it turns out the bookstore guy is a ninja-grade stalker, wielding his mastery of social media to conquer one attention-seeking Millennial girl after another. Think Dexter, but with stalking instead of serial killing and a shakier moral code. Also, think a lot of rom-com tropes subverted since we all know it doesn’t take much for a rom-com hero to actually look like a stalker. Sounds perfect, really. It’s simultaneously on-brand for the network while also not-so-gently nudging Lifetime into appealing to a younger demo, giving all the Instagram obsessives a wake-up call about what their oversharing can lead to while also entertaining the hell out of them with irresistible soap opera. Then Berlanti brings Sera Gamble into the mix. She’s going to run the show should you give it the greenlight. She used to have that job on Supernatural, and now she’s doing it for The Magicians, another literary adaptation which has been making noise on SyFy with its form-altering innovations (Vox calls it’s 2017’s answer to Buffy the Vampire Slayer). More importantly, it’s a huge hit, at least by SyFy standards. Most weeks, it’s the most-watched show on the network. Getting her to make anything for Lifetime is a big get. Sera Gamble’s The Magicians and its great season 2 heist episode. Not only do you jump at the chance to get in business with them, you give them a straight-to-series order. Screw the pilot process. They’ve packaged a product so enticing you want at least 10 full episodes to slot into your Fall 2018 lineup. It’s roughly a year later now. The Magicians is still one of the biggest shows on SyFy, yet Sera has beautifully done both jobs, delivering you a series which is better than you could have ever imagined. The cast is absolutely perfect, especially the lead, Gossip Girl alum Penn Badgley, an actor with clear rom-com leading man looks – he was in Easy A, after all – but just something off enough about him to seem like he might kill you. They needed to find another Michael C. Hall, and they came through. He is sure to light up social media because so many fans are going to be torn over whether to love or hate him. On top of that, the bingability factor is extremely high since every episode ends on a cliffhanger, and they absolutely nailed social media and all the ways technology and modern dating intersect. You love everything about the show so much that you decide to give it a renewal for a 10-episode second season over a month before the show premieres on the network. That’s your signal to your audience and the people working on the show as well as to everyone else in Hollywood that you will support quality content and can be trusted as a brand. The fact that you announce this early renewal during your presentation at the Television Critics Association Press Tour is also your signal to the tastemakers: please, please, please (!) write about this show! We’ve got our marketing department working overtime on this, but we’re going to need your help to cut through the Peak TV clutter. The tastemakers all comply and generally, all agree: you should be proud of this deliciously trashy, but surprisingly innovative show. USA Today’s Kelly Lawler calls it “captivating, right from its demented beginning.” TV Guide selects it as one of the must-watch new shows of the Fall. Sera Gamble is out there on the publicity tour giving one hilarious, yet insightful interview after another, delighting in her show’s takedown of self-proclaimed male feminists who are secretly anything but. Gamble from a New York Times profile. Momentum, thy name be You. Ok. That’s a super awkward sentence, but you know what I mean – you think you have a hit on your hands. Then the show finally premieres. Well, maybe not entirely crickets. You average 1.1 million viewers per episode, including DVR and delayed viewing, from September to November, far below expectations. No internet memes take off. No amount of “Why you should really be watching You” thinkpieces from TV critics moves the needle. You backed the right people. You aggressively pursued them, actually. You let them churn out a campy thriller which is totally on-brand but also slightly more nuanced than your normal programming. You deployed both traditional and social media as part of your marketing campaign, and you ended up getting some major TV critics and publications on your side. None of it mattered. The viewers just weren’t there. As much as it kills you to do so, you have to renege on your previous commitment to that second season. Financially, there’s no way to justify the expense, and the higher-ups at your network are now more convinced than ever that the only path forward is to double, nay, triple down on original movies. The goal going forward is to produce at least 75 original movies in 2019. A lot, lot more of this. Still, you’d like to salvage something out of You. Netflix, familiar with Greg Berlanti due to his CW superhero shows and The Chilling Adventures of Sabrina, already had the second-run streaming rights and first-run global rights. When you hear Netflix plans on using You as part of its annual Christmas surprise by putting the show up the day after X-Mas, you just hope it maybe means some people will finally watch the damn thing. All the potential you saw in the show truly was there the entire time; you were just the entirely wrong messenger for it. WTF do you do with that? The above question – if you’ll allow me to back away from my little thought experiment – applies not just to Lifetime but seemingly the entirety of the cable TV landscape right now. Shows are boosted by Netflix all the time. See: Shameless, Riverdale, Jane the Virgin, Schitt’s Creek, Grey’s Anatomy. The You example feels different. “The more I think about it, the more I think ‘You’ flailing on Lifetime and being treated by the viewing public as a Netflix original is going to be remembered as a major turning point in what will shortly be a contraction of the TV industry,” tweeted Variety’s Daniel D’Addario. Counterargument: There is nothing more significant to this than a simple misreading of the market. You is a youth-leaning show which aired on an older-skewering network, one which has aggressively cultivated a, yes, recognizable brand identity but also a highly mockable one. Sometimes, no amount of critical acclaim can overcome that “I’m not watching something on Lifetime!” hurdle. Beyond that, Lifetime doesn’t have its own streaming service, a deal-breaker for all those cord cutters and cord nevers. Cable can’t compete with that. You shows basic cable channels that rely on scripted content are in for a uniquely tough road ahead. They don’t offer easy binge-watching like streaming services; they don’t have news or sports like broadcast networks; they can’t be R-rated like premium channels; and they don’t have the budget to cast, say, Julia Roberts (Amazon Prime’s “Homecoming”) or Emma Stone (Netflix’s “Maniac”). Plus, even if they could afford a major movie star, who knows whether their audience would watch? Huh. “Creepy” but “also endearing”? Kind of sounds like the main character of a little show I like. Total stalker, though. Still, I couldn’t stop watching him on Netflix earlier this month. Can’t wait for season 2. Have to know if (insert huge spoiler name of character) is really off the show for good now after that shocking finale. The death of traditional media has long been predicted and lots of smart people think five-ten years from now the TV landscape will be unrecognizable. Considering how far Netflix has come in just a short amount of time and how much change that has brought to the entertainment industry as a whole, that certainly seems likely. The success of You might end up being little more than a footnote in that story. However, in the here and now let’s not forget it: a cable network produced a show worthy of being watched and obsessed over by around 40 million people. All it took for that to happen was for that show to get off that network and onto Netflix. If I’m that same person at Lifetime who championed You I don’t look at all of this in despair. Instead, I simply see about getting at job at Netflix. That’s where the action is at it. Obviously. Unless you just love making purposefully cheesy Original Movies, but, honestly, Netflix will probably be gunning for that market before too long in its quest to be everything for everyone. Good luck.